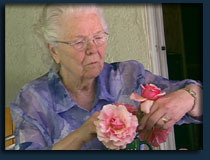 Antelope, CA: Mrs. Mae Nutt, “Grandma Marijuana”, passed January 1, 2008 away at the age of 86. Mae Nutt, motivated by the sickness of her son Keith and his increased quality of life using medicinal cannabis for his terminal cancer, began distributing medical cannabis to other ill and dying patients in Beaverton, Michigan, her home. Mae, Grandma Marijuana, is an icon, a model of compassion and an inspiration for those who need and those who provide therapeutic marijuana. Mae and her beloved husband Arnold Nutt dedicated themselves to educating the US public about the medical uses of cannabis. They were named “Citizens of the Year” by the Drug Policy Foundation, DC in 1990. Mae was Vice-president and co-founder of the Alliance for Cannabis Therapeutics, the first organization in the modern US to advocate for a patient’s right to medical marijuana. Mae was a sitting, Founding Director of Patients Out of Time, an educational charity that educates health care professionals and the US public about the efficacy of therapeutic cannabis. Mae’s family is planning a memorial service on her birthday, June 28, 2008 at the Billings Township Cemetery, Sisson Funeral Home, Gladwin, Michigan. It was the wish of Mae that donations in her name be made to Patients Out of Time. Medical marijuana activist and grandmother Mae Nutt, died January 1, 2008 in Roseville, CA. Mrs. Nutt was a medical marijuana activist for over 25 years, motivated by the cancer battle she witnessed in her son Keith, who alleviated his chemotherapy symptoms by secretly smoking marijuana. When she discovered that the drug reduced his nausea, she proceeded to battle the government to make marijuana available to anyone who could prove a medical need. She and her husband were instrumental in the passage of the first medical marijuana legalization bill in Michigan in 1979. They were the recipients of the national Citizens of the Year from The Drug Policy Foundation in Washington, DC in 1990. Mrs. Nutt formed the Alliance for Cannabis Therapeutics with Patient “O” Robert Randall, the first person to get medicinal cannabis from the federal government. Mrs. Nutt and Mr. Randall testified before DEA Law Judge Francis Young. The Judge was so moved by their testimony that he ruled that medicinal cannabis should be available to everyone who needed it. The DEA rejected their own judge’s ruling. Mrs. Nutt was most recently featured in the award-winning documentary Waiting to Inhale. She has also been profiled on CNN News and the CBS Evening News, and was labeled Grandma Marijuana in an extensive article in High Times Magazine. She regularly participated in the biennial Patients Out of Time and Drug Policy Reform conferences. Nutt, Belle Emma (Mae) Born June 28, 1921 in Rochester, NY, the daughter of Louis and Gladys (Yaw) Wallace, Mae was predeceased by her husband of 46 years, Arnold Nutt, and two sons, Keith and Dana. She is survived by her daughter Joyce Born of Westland, MI, and her son Marc Nutt and his spouse of Antelope, CA. She is also survived by her grandchildren Amy Korte and David Born, their spouses, and 5 great-grandchildren. If you support legalization, visit Potlegalization.com and tell us why.